Reminder: The League of Women Voters helps people register to vote, but we DO NOT maintain the lists of registered voters. If you have a problem with your registration, contact the Lehigh County Voter Registration Office at 610-782-3194. 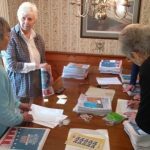 Twice a year, Lehigh Co. League members meet at a member’s home to bundle copies of the Voters Guide for mailing and distributing.. The League of Women Voters of Lehigh County and the League of Women Voters of Northampton County have a joint policy that governs which candidates are included in the Voters Guide, and which candidates are invited to candidates events. 1. A candidate must be legally qualified for the office he/she seeks. 2. The LWV Board will include all candidates whose names appear on the official certified ballot lists for voters in Lehigh County. The Board will determine which offices are to be covered in its Guide. 3. The Board will send letters with response forms to ballot-qualified candidates, but does not assume responsibility to follow up with candidates who do not respond. 4. Candidates who are unopposed will have only their name in the Guide with the exception of candidates running for state and federal offices in General Elections. 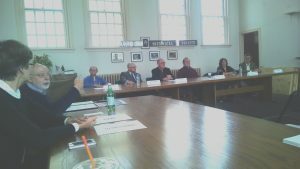 We moderated a forum of candidates for Coopersburg Borough Council in 2015. 5. In the event of a legal challenge to a ballot candidate, the League will use its production deadline to determine certified candidates. 2. A candidate’s name must appear on the official Pennsylvania ballot. 3. In determining eligibility using these criteria, the burden of proof is on the candidate, not the League. A candidate must provide information to show that he/she meets the criteria at least three weeks before a scheduled taped or live forum. 4. If only one candidate appears for a forum or debate then the event will be canceled.